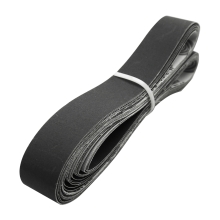 There are 12pcs 1in width 30in long black soft cloth sanding belt, which assorted 400 / 600 / 800 / 10000 grits for you to choose. Pack contains 3 each: 400 grit / 600 grit / 800 grit / 1000 grit industrial quality sanding belts. Tested by both Moisture-Resistant & Heat-Resistant. Applicable to wood materials, aluminum products, plastic and glass fiber. Silicon carbide grain / closed coat / heavy duty y-weight polyester cloth backing. Precision engineered bi-directional tape joint, anti-clogging stearate, and resin over resin bonding for long belt life.